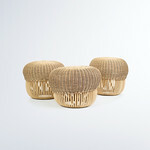 Takraw by Mobellaの概要 The Stool was inspired by Thai weaving techniques its call “Takraw”in Thai meaning. This design has combine between the creation of forms and upholstery techniques together. The stool has a very unique design. This stool is designed in consideration of implementation issues such as the use of sustainable materials that are environmentally friendly. Of natural fibers such as cotton. Non-toxic sponge. And design to be able to disassemble, repair and recycling. This stool can be used for men and women. 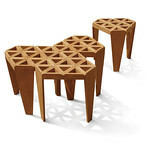 With the selection of the material inside and wooden structure of stool. Made this a comfortable stool. The Stool is produced by the traditional process. Its call industry craft(skill of human and machines). Its made become this stool Has a values different from the others stool that ​​produced by the machines. ユーザー・社会に伝えたいこと The concept of this stool is designed from a combination of Thai inspired and ECO concept. Making it suitable for any occasion and use it many places. In addition, the design also consider about materials, safe and friendly environment.